Yet another cool and misty morning greeted us as we piled into the vans. Today, they would take us from Monchy-le-Preux to the D-Q Line to Canal du Nord – we’ve already reached the sites of the First World War’s closing months. Those events of a century ago can seem impossibly distant, but today’s battalion presentations revealed how our personal ties reach back across the generations that separate us from that time. We began with a stop at Monchy-le-Preux, where Laura discussed the Royal Newfoundland Regiment’s involvement in the Battle of Arras. They engaged the Germans at Monchy-le-Preux on April 14, 1917 in a battle that ended with no gains for either side. However, the severely depleted Newfies managed to hold the town, which was a key position. For several hours, just ten soldiers defended it until reinforcements arrived. Laura’s family roots are in Newfoundland, and it was a special moment when she was able to leave a Canadian flag at the Monchy memorial. 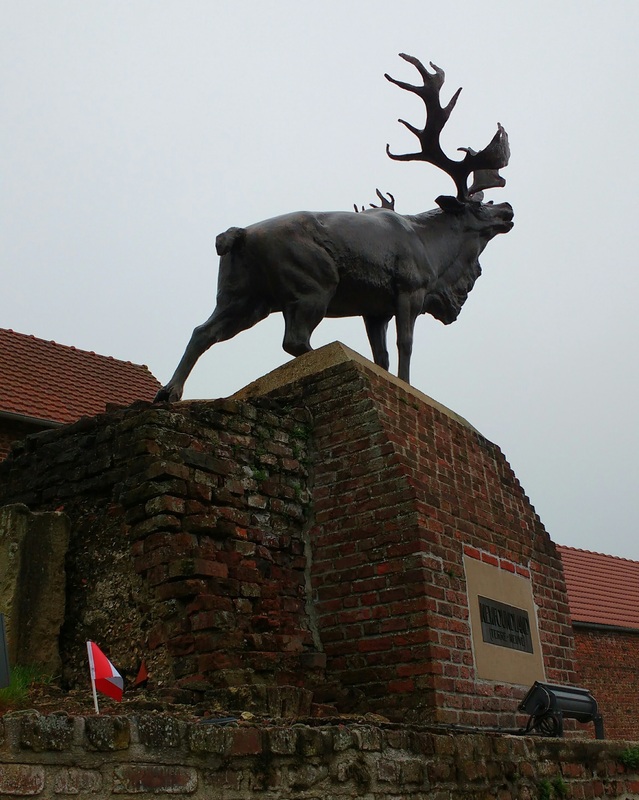 The caribou statue faces in the direction of the enemy lines; its antlers reached up through the rain and the newly-planted flag at its feet whipped in the wind as we left. The country roads next took us to the Dury memorial cube, which stands at the D-Q (Drocourt-Quéant) Line. Shelagh explained the breakthrough that occurred here in September 1918 during Canada’s Hundred Days. The Canadian Corps had little time to prepare for action – in fact, final orders were only issued the night of the attack. Nonetheless, they made steady progress, capturing their objectives and German prisoners, and the Germans withdrew from the D-Q Line. Here, as at all the other memorial cubes, we took a moment to sign the visitors’ book. This is always a time to reflect: on the battles we have just learned about, on the lives lost, and on what it means for us today. The capture of the D-Q Line was followed by the battle of Canal du Nord, which began on September 27. Brad and I both did presentations here about the 1st and 38th battalions, respectively. Like Laura, we had personal connections to these battalions, as we had each picked ones that were recruited from our hometowns. The 1st Battalion originated in Western Ontario, while the 38th had soldiers from Ottawa and the surrounding area. Canal du Nord today. 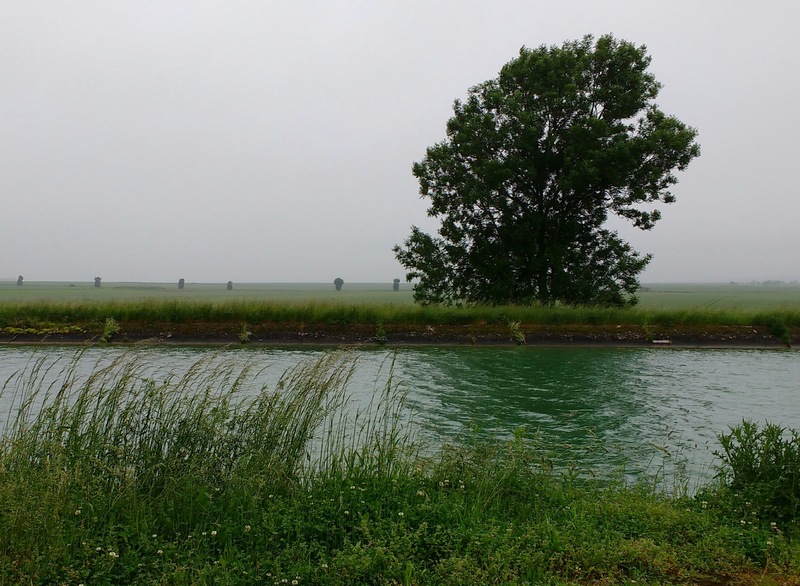 At the time of the battle in 1918 the canal was still unfinished and hadn’t been filled with water. The Canal du Nord battle was part of the push to capture Cambrai, an important transport and supply centre for the Germans. Lieutenant-General Sir Arthur Currie’s risky strategy called for the soldiers to cross Canal du Nord at a narrow opening that exposed them to enemy fire. They were to then fan out and take objectives such as Bourlon Wood. Meanwhile, engineers had to build bridges across the canal to transport the artillery that provided essential support for the forward troops. In short, the operation required sophisticated logistical planning and excellent execution to succeed. Succeed it did, and Currie considered it the greatest Canadian victory of the war. The 1st and 38th battalions contributed to this achievement, but they paid the price. It was difficult for Brad and me to walk among their graves at Ontario and Cabaret Rouge Cemeteries. Although we are decades removed, we share a certain kinship with these fallen men. Yes, a hundred years does seem like a long time ago. But it doesn’t feel that way when we are at their gravesides, and we think about how we’ve walked the same streets, seen the same sights, and called the same place home.